The Empire, of course, has methods of its own. And Nizam Ul Mulk is itching for an opportunity to exact revenge of the formidable Bajirao. With assassins, saboteurs and criminals infiltrating the Maratha lands, the Mughal Empire scores as many victories in the night as the Peshwa does during the day. Meanwhile, in the far reaches of the country, set ablaze by the never-ending conflict between these major powers, a Sikh warlord, a Rajput king and a Bundela princess find themselves increasingly tangled up in the endgame that will determine the very course of history. It is a battle of wits and skill, and the greatest deceiver of them all will prevail. 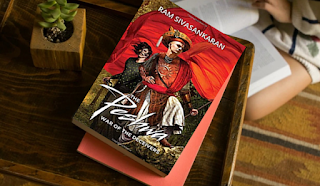 If you have read the first installment of the series (The Peshwa: The Lion and the Stallion) then you already know this one is going to be just as great. If you haven’t, the world of history is waiting to capture. Never have I ever thought, history will keep me glued to a book, but in this case, it ensured I end up reading all night. The cover art catches the eye with its vibrant colors. The book blurb is honest and straight forward, it paints the exact picture of what you are in store for once you open the book. Politics, assassin, war, people with personality to make or break history is incorporated into the story very elegantly. The characters are set in a diverse era, however, they are described so well along with the scenes which unfold, and you will clearly imagine yourself as a part of this book. The language is mixture of Hindi, English, Marathi, and Sanskrit at few places which is quite necessary for the plot of the book, taking into consideration the set up. The language and narrative still follow a simple flow and in easy to understand, although it loses it pace at a few areas, it can totally be ignored upon. I highly recommend reading both the Part I and Part II for the Peshwa series.